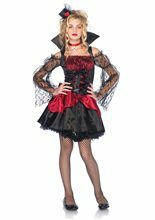 Deluxe Goth Lace Vamp Child Costume.Includes: Gothic Lace Sleeves with tassels, Gown, Tassel Tie Belt, Stand-up Gothic Lace Collar and Choker.Available Sizes: Child - Small (4-6), Child - Medium (8-10), Child - Large (12-14). (See Size Chart For More Information)*Stockings and Shoes Not Included. 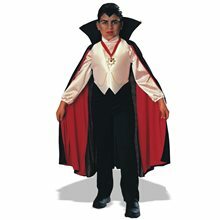 Nocturna Vampire Princess Tween costume is black in color .It is another beautiful night for the Vampire Princess. It comes in sizes Child/Tween L (10-12), Child/Tween XL (12-14) Item Includes:Dress with Attached Collar, Choker. 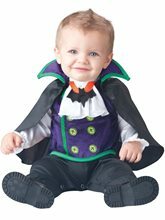 Gothic Vampiress Child Costume; Gothic Vampiress Child Costume this includes the dress and the collar. 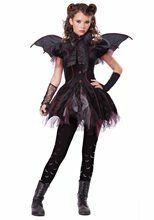 Bat Girl Child,Black double knit dress, bat wings with red glitter accents and bat dolly. *Wig, knee high socks, and shoes NOT included.